If you have a puppy, it is incredibly important to make sure that you give them the best nutrition possible from the start. This is especially the case when you have a large breed dog that has a lot of growing to do! One of the dry kibble options on the market comes from Eagle Pack, a dog food brand that has been formulating natural food for more than 30 years. The brand’s Large and Giant Breed Puppy Formula is certainly a dog food we wanted to look into, especially for those who have puppies that will grow into large, or even giant, dogs. Eagle Pack’s puppy food for large and giant breed dogs offers a complete nutritional profile for your puppy. The company has been perfecting this formula since the 1980s, and today, it uses a formula featuring two different proteins, lamb and chicken, along with DHA, a natural amino acid, which is also found in a dog’s milk. This is an important element for young puppies to have as they transition from being fed by their mother to dry kibble. This particular food from Eagle Pack is for people who have puppies that will grow to be 50 pounds or larger when fully grown. Some of these breeds include German Shepherd, Rottweiler, Doberman Pinscher, Great Dane, and Mastiff, though any large dog breed can greatly benefit from the Large and Giant Breed food from Eagle Pack. Since this formula is made of all-natural ingredients and is a premium dog food, the price tag is a bit higher than other puppy foods we have seen on the market, so someone who chooses the option also has to take their budget into consideration. If you don’t have a flexible budget, you might want to look into another product. When ordering a bag of Eagle Pack’s large puppy food, what you see is what you get. You get a single bag of dog food delivered right to your door. There is nothing fancy about the bag other than it is brightly colored and has information about the brand and the food itself. The bag also displays a full list of ingredients. You do not get any accessories or extras here. When you order, you are simply getting a bag of dog food. When purchasing this puppy food, you will note that it comes in a 30-pound bag. There is also a 15-pund version available, but most large or giant breed dogs will go through that very quickly. So, it’s more economical to choose the larger bag. As mentioned, the food contains chicken, lamb, and DHA, but the company has also created the formula as to control calories, which helps to keep your puppy at an optimal weight. Eagle Pack has also created a formula of essential minerals and vitamins, which helps to support the immune system of your puppy. Since this is a premium puppy food, you won’t find any animal by-products, corn, wheat, or artificial flavors or colors. Eagle Pack has a feeding guideline for pet owners who choose to purchase the brand’s puppy food. Depending on the size of your puppy, you should feed the dog the amount recommended by the company. Just keep in mind that as your puppy grows larger, they will need more food, so make sure to watch your puppy’s weight to determine when it’s time to add a bit of Eagle Pack puppy food into their daily feeding schedule. The company recommends feeding a puppy two to three times a day, and always ensuring that the dog has fresh water to drink. Though we think this is a great food for a large or giant breed puppy, it’s certainly not an option for everyone due to the cost of the product. Additionally, some puppies are picky eaters and they might not like the flavor of this kibble. One alternative that we think is worth checking out is Blue Buffalo’s Large Breed Puppy Formula. It is made with chicken and brown rice, and is slightly cheaper than the Eagle Pack product, but just as highly reviewed. 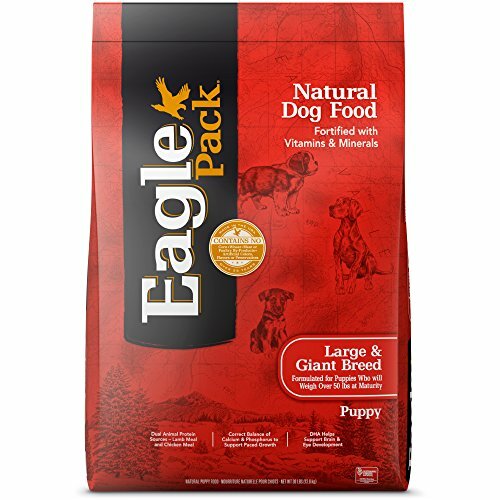 For pet parents of a large or giant breed dog, this Eagle Pack puppy food is a winner… if you can afford it. The ingredients are top-notch, and you won’t find many mainstream dog foods that have two high quality proteins in them. Since this is a more expensive food, some recommend mixing this food with a cheaper option to make it last longer. If you do this, make sure that you are creating a mix of food the right way and slowly getting your dog used to the formula you create. You should speak to your vet about the best way to do this.